ISBN: 9781584651611 | Published by: Chipstone Foundation | Year of Publication: 2001 | Language: English	472p, H305 x W244 (mm) 648 illus. (544 colour). 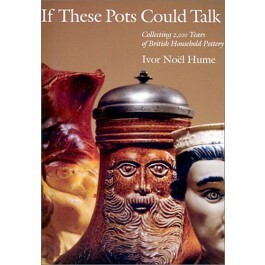 Archaeologist and social historian Ivor Noël Hume brings British history to life through his accessible story about the everyday ceramic objects he and his late wife collected over a 40-year period. If These Pots Could Talk presents "a panoramic view of pottery in Britain and her colonies from the landing of the Romans to the bad intentions of the Germans in 1939." Beginning as a novice at London's Guildhall Museum in the immediate postwar years, Noël Hume shares his passion for reconstructing lives from bits and pieces of crockery. He describes in vivid detail the common household pottery he unearthed with a bright graduate of Bristol University and the four decades of collecting (and marriage) that followed. Concentrating on earthenwares, stonewares, and porcelains commonly found in archaeological excavations but uncommonly encountered in decorative arts exhibits, his book runs the gamut from burial urns and chamber pots to wine cups and witch bottles. Cultural and even political history form the warp and weft of the narrative. Written in a personal and often humorous style, this gorgeous and hefty volume will appeal to nonspecialists and experts alike. Wonderful color photographs, largely by noted photographer Gavin Ashworth, enhance the historical and personal commentary. Part catalog, part memoir, If These Pots Could Talk is a beautiful tribute to the richness of collecting and the rewards of a true partnership.